Scientifically referred to as Necrosyrtes monachus, the Hooded Vulture is a descendant of Old world vulture belonging to the Accipitriformes order just like kites, eagles, hawks and buzzards and is a member of Necrosyrtes genus thriving in the Sub-Saharan Africa where it is explored on Africa birding safaris including birding safaris in Uganda. The Hooded vulture is a small vulture compared to other vultures featuring a dark brown plumage, bare crown, fore-neck and face and long thin bill as viewed on Uganda birding safaris and tours. The hooded vultures stretch between 62 – 72cm in length and weigh 1.5 – 2.6kg. Breeding occurs in their stick nests built in trees where one egg is laid. The incubation of the hooded vulture lasts forty six (46) days. The stick built nest is always 20 – 120 feet high in the tree and is utilized year after year. The male is responsible for providing food to the female and the chick while still young but after three (3) weeks parents start going together to look for food. The fledging takes 120 days while the entire lifespan ranges from 20 – 25 years but can stretch up to 30 years while in captivity. Like other Vultures, the hooded vultures are notable scavengers but because of their weak bill and small size, they wait to pick up scraps from the carcass after the larger vultures have had a feast as explored on birding safari in Uganda. They as well feed at spiny lobsters, mussels and dead fish on the sea shores while in urban centres, they scavenge in gutters and dumps. The hooded vultures also consume grasshoppers, locusts and grubs. The hooded vulture moves in flock and they can be seen soaring in the sky during the day time in areas where they thrive. But unfortunately, the numbers are decreasing due to habitat loss, poisoning and hunting. In fact the hooded vulture is listed as critically endangered on the red list of International Union for Conservation of Nature (IUCN). 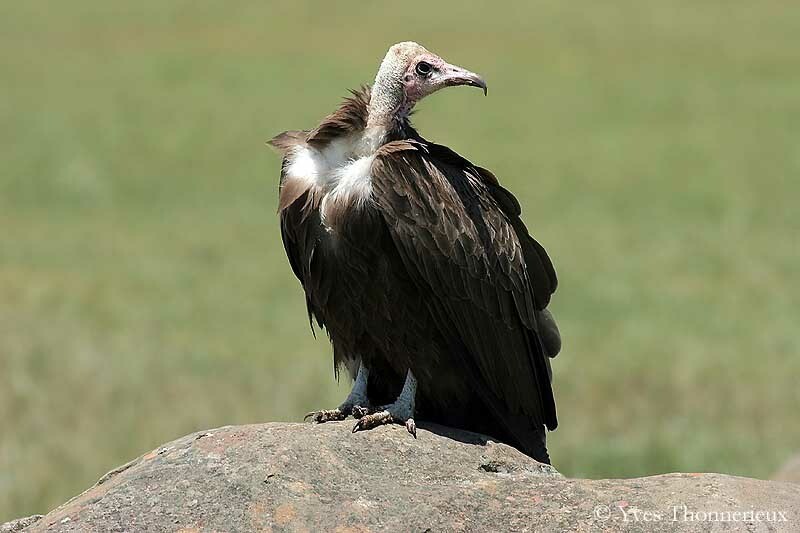 The hooded vultures thrive majorly in sub Saharan Africa and their habitat include; savannah, open plains, coastal areas, forests and villages. In Uganda, they mainly thrive in Queen Elizabeth National Park.